The news is troubling, given that XP won't be patched after next April. Windows XP is the operating system that refuses to die. That's the takeaway from newly-published Web statistics that show the declining global market share of Windows XP stabilizing in October. It was starting to look like the world was getting serious about migrating away from the venerable Windows XP operating system. The OS loses security patch support from Microsoft on April 8, 2014. It's end of life has been a major focus for Microsoft and a crisis of sorts for organizations that are still stuck on the OS. 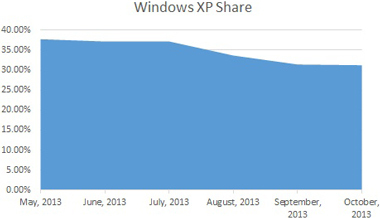 In recent months, Windows XP has shed share very quickly. According to measurements by Net Applications, Windows XP clunked from 37.19 percent in July down to 33.66 percent in August, and then further plunged to 31.42 percent in September. However, in the updated figures for all of October posted today by Net Applications, the momentum downward has apparently stalled. Windows XP's share now stands at 31.24 percent of all desktop operating systems in use worldwide -- virtually unchanged from the month before (see chart). Users who don't migrate away from Windows XP will be vulnerable to zero-day exploits and other security holes as Microsoft won't patch Windows XP after the April 8 date. Hitting on that theme last month at the RSA Conference in Amsterdam, Microsoft claimed that Windows XP systems are already six times more likely to be successfully hacked than Windows 7 or Windows 8 machines. Once support ends, attackers will wait for Microsoft's Patch Tuesday bulletins and treat them like a shopping list of new ways to attack Windows XP, according to one security expert. The decade-old Windows XP has been a well-entrenched OS, commanding 50 percent of PC use in 2011, according to Net Applications' data. Windows 7 use finally surpassed that of Windows XP in August 2012, when both operating systems hovered around 42 percent of overall PC usage, per Net Applications, which relies on thousands of partners worldwide running its software to capture platform information about systems visiting their sites. The October stall could have import or it may be a statistical blip. With 159 days until extended support ends for Windows XP, we'll see if these stats signify a pause or the outlines of a hard kernel of users who won't be upgrading at all.